Happy Thanksgiving! We celebrated Thanksgiving here in Australia yesterday, as my husband is American. Turkey, mashed potato, gravy, cranberry sauce, peas, corn, rolls and of course dessert — sweet potato pie and brownies. 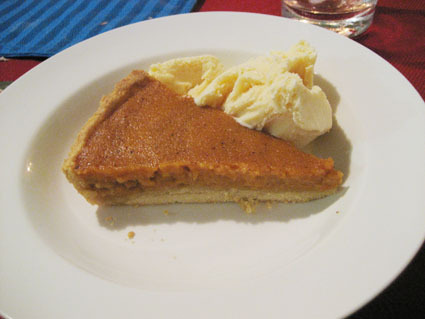 I’d never eaten sweet potato pie before, only seen it (and pumpkin pie) on many American TV shows. Husband prefers sweet potato pie over pumpkin pie, so I aimed to please. The recipe received thumbs up from all; our Thanksgiving guests had not eaten it before either. I couldn’t bring myself to buy a ready-made pie crust, the frozen pie crusts at the supermarket just looked so artificial and lacking in goodness! I made shortcrust pastry by rubbing cold butter into plain flour, then forming dough by adding a tablespoon or two of iced water. It was fairly quick, and definitely worth the extra effort. I found 40 minutes was enough time in the oven for the pie. View recipe and reviews here. Many people find sweet potato too pie stringy. There’s a very simple solution to this problem. After cooking and peeling the sweet potatoes, whip them in a mixing bow. The heavy fibers will gather on the beater blades. Simply rinse off under the tap. Do this a couple of times and your pie will be smooth as butter. I serve sweet potato pie all the time and never pumpkin. I always fool people at my table. They don’t believe it’s sweet potato pie because it’s so smooth. Also, try substituting dark brown sugar for the white sugar. You’ll get a richer flavour. Thanks for the info! I often use half brown and half white sugar. The Australians I have served this pie to are amazed – they’ve never had anything like it before. Sweet potato is not usually served sweetened here.